My apologies for missing a few days of mosaics. My birthday and surrounding festivities intervened with me getting in the studio. But it's back to the blog for me now, and I'm actually really glad to be back at the project. I've never used a pyrite sun before, only pieces, mostly because I worry that somehow what I create won't be worthy of such a beautiful object. Worry that I'd end up "wasting" it. 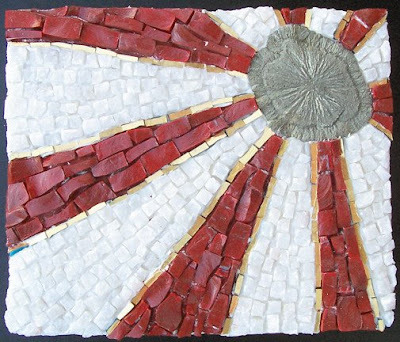 However, I am thoroughly pleased with this piece, and I encourage all you mosaic artists out there to try that special item you've been saving. If you don't use it, you'll never know.